Two crucial final races off Newcastle’s Stockton beach on Easter Sunday completed the eight-race Audi IRC Australian Championship and three new national champions have been crowned. 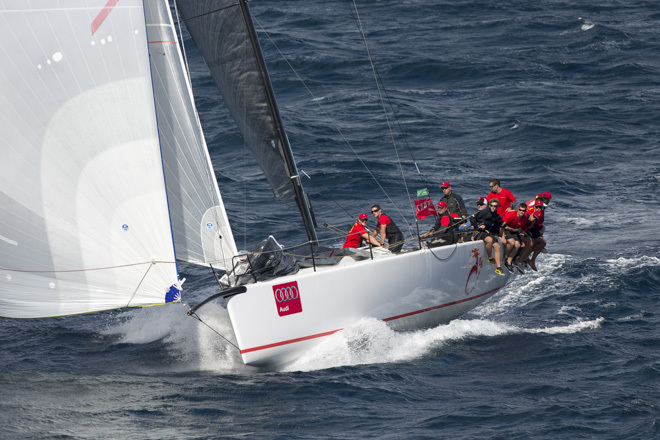 Team Beau Geste’s division A triumph was taped up yesterday giving owner Karl Kwok and his TP52 crew from New Zealand the clean sweep of the TP52 Southern Cross Cup in December, the NSW IRC title last Sunday, and now the cheeky fellas from across the ditch are Audi IRC Australian champions. Twenty-four year-old youth America’s Cup skipper Will Tiller drove Kwok’s 52-footer to its maiden national IRC victory and also the state IRC victory at Sail Port Stephens. “It was challenging; not the easiest place to sail with the sea-state,” said Tiller this evening adding, “Newcastle is a cool city”. 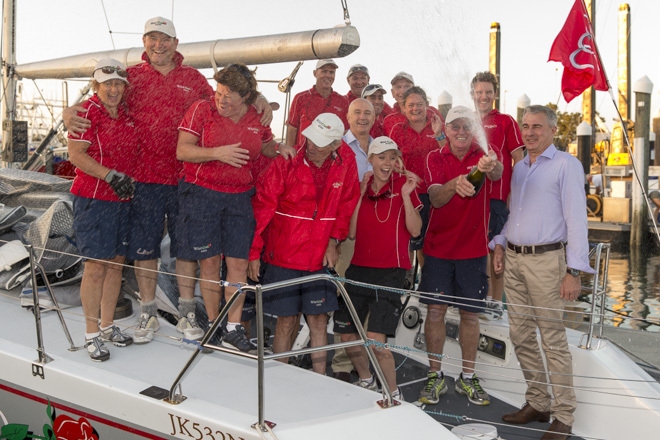 Only Tony Kirby’s Ker 46 Patrice and Bob Steel’s TP52 Quest managed to take a win off Team Beau Geste during the series hosted by Newcastle Cruising Yacht Club. They finished second and third on 15 and 19 points respectively to the victor’s eight points. 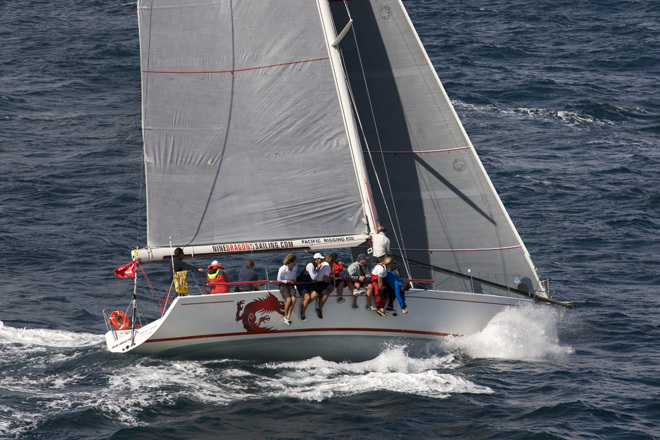 Division B’s four-day nail biter between the two DK46s, Nine Dragons and Exile, added grey hairs to both Middle Harbour Yacht Club crews. 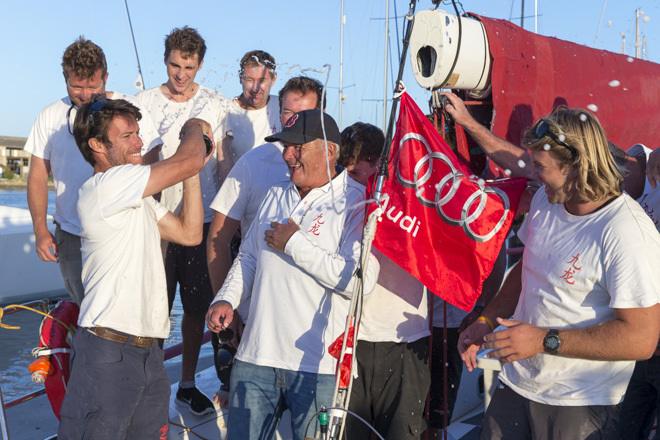 Après racing it was all smiles across the bar, but each badly wanted the coveted title and the North Sails’ Audi IRC Australian Champion emblazoned spinnaker. 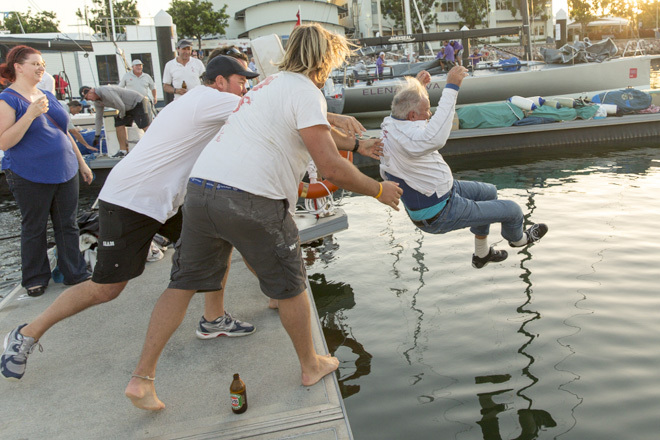 After the champagne was sprayed the Nine Dragons crew cornered Cox and first tactician Mitch White and threw them off the marina, a sailing ritual. 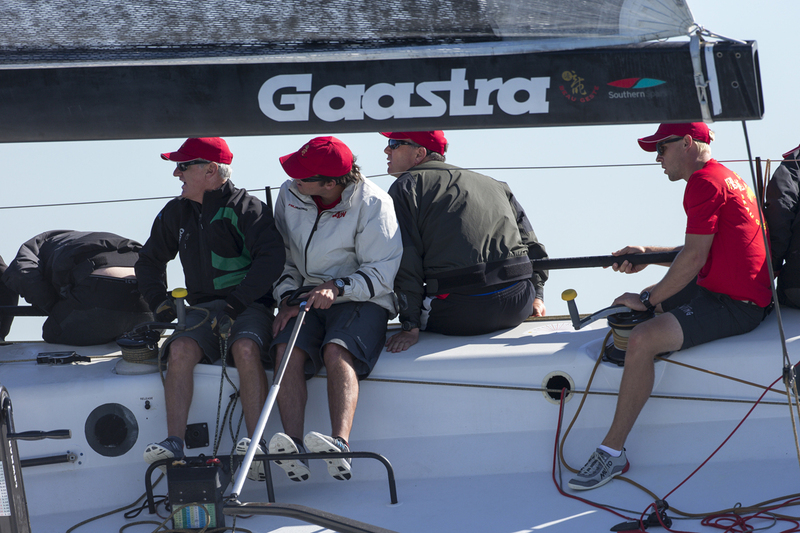 Roger Hickman’s near 30 year-old Farr 43 Wild Rose from Sydney’s Cruising Yacht Club of Australia was clapped into the marina by an appreciative crowd as the new division C Audi IRC Australian champion. Hickman is an ocean racing hero to many, and again he’s shown the pedigree of his years on the circuit, and his steed’s. 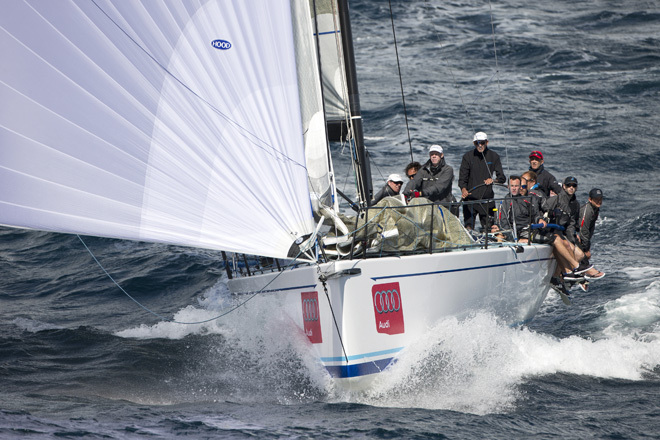 Phil Dash’s Beneteau First 40 Justadash (MHYC) finished second and Ian Bower’s RP36 Spirit from Lake Macquarie third in division C.
Race seven got underway in a 6kt sou’easter following an hour and a half postponement. Race eight was christened the ‘Newcastle BBQ’, a triangle, triangle and sausage format also called the ‘two chops and a sausage’ course. NCYC CEO Richard Howard praised his large team of 30 plus volunteers involved in the planning phase through to the hosting of 31 top level international crews. Howard says the club has excellent engagement with its members and volunteers put their hands up to pick up glasses, cook the BBQ, make sandwiches, sell raffle tickets and host competitors. On the race management side, members spent long days in the sun laying marks and assisting PRO Denis Thompson. “From the time of the bid announcement the membership and staff really embraced the championship,” said Howard.